It was all going to be different this time. 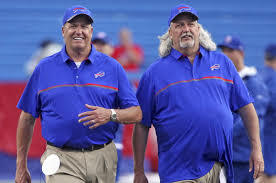 Despite a 34-46 record over the previous five seasons, Rex Ryan brought his best friend and brother Rob to Buffalo to help the egregiously underachieving Bills defense turn it around in 2016. The Bills responded by giving up 50 points in the first two games and were 0-2. But then on October 2nd it happened. Rex Ryan’s annual Super Bowl opponent was on the schedule. Since Ryan’s teams don’t make the playoffs anymore, he lives for his two matchups with his rival Bill Belichick. Buffalo came into Foxboro and shutout the New England Patriots 16-0. How the heck did this happen? The Ryan brothers apparently devised an astounding game plan and somehow stopped undefeated (1-0) rookie quarterback Jacoby Brissette. Back-to-back wins over Arizona and the Patriots after starting 0-2, here come the Bills! Rex was at his comedic best after the game mimicking Belichick’s famous “On to Cincinnati” by saying “On to L.A.” Rex you are hilarious. And then a 30-19 thumping of the Rams and a blowout of the hapless 49’ers by the Bills and it looks like we have a divisional race here? Uh-oh, what the Bills didn’t anticipate was having to go into 2-4 Miami and face the juggernaut Dolphins who have the 20th best offense and 24th best run offense in the NFL. Bring on 439 yards of total offense, a 200 plus yard rushing game from Jay Ajayi and 22 unanswered points from Miami in the second half to hand the Bills their third loss of the season. I wonder if Rex lost his focus and was looking ahead to his Super Bowl game this coming week against New England. What a bunch of frauds the Ryan brothers are. When former Jets quarterback Mark Sanchez is the key to your success, then we call that a fluke. And how about Rob Ryan’s credentials? During his 12 seasons as defensive coordinator, this great defensive architect has had his defenses averaging ranking 23rd, finishing in the top 10 twice and the bottom 12 – nine times. The cumulative record of Rob Ryan’s teams is 71-121. He has been a part of one playoff win and one winning season. Time for the Ryan boys to go quietly into the night. Brace yourself. There is a Harbaugh complaining about officiating and rules again. It had been almost seven weeks since one of the Harbaugh brothers was complaining about something. Ravens coach John Harbaugh complained twice in a span of 11 days. These complaints only seem to happen when Baltimore is adversely affected by something that happens. This time it was Michigan coach Jim Harbaugh stating that a replay decision that was upheld during their 41-8 victory over Illinois was “the worst call he’s ever seen”. Hey maybe Jim can loan John some wins since the Ravens have dropped four straight. The Raiders haven’t had a winning season in 13 years but are 5-2. Donald Trump has convinced me that their success is rigged. I can’t tell you how much respect I have lost for Kevin Durant. Not because he left Oklahoma City! Not because he didn’t come to Boston. Because he didn’t have the faith in himself or have the desire to be the centerpiece in his own triumvirate. And then he trashes his Thunder teammates on the way out as being selfish? When his epitaph is written, yes he will be a champion, but no one will be talking about him. They will be talking about how he piggybacked onto a dynasty so he could have his championship ring(s). Now that is something that deserves an asterisk. Karl Malone and Gary Payton tried to do this at the end of their career when they were well past their prime, I get that. Ray Bourque did it in hockey after two decades. It used to be that the mark of a superstar was winning a championship. This label seems meaningless now after Durant and LeBron James did what they did. I look at guys like Charles Barkley, Patrick Ewing, Allen Iverson and John Stockton and we should respect them less because they didn’t try and orchestrate their way to secure a championship ring. So are there any storylines to be excited about this year in the NBA as we prepare for the inevitable rematch of the Cavaliers and Warriors. Can the Knicks be relevant again with veterans Derrick Rose and Joakim Noah? Will Rajon Rondo annoy the hell out of Jimmy Butler and Dwyane Wade? With Nerlens Noel and Ben Simmons already hurt, have the Sixers once again planned their tanking strategy? Without real contenders in place for the frontrunners, Commissioner Adam Silver has some work to do. With the release of 2015 first round pick R.J. Hunter, General Manager Danny Ainge’s draft record continues to get worse. During his 13 years, Ainge has drafted 38 players. In 2004, he had his best year by far when he selected Al Jefferson, Delonte West and Tony Allen. Avery Bradley at 19th in 2010 was great and beyond that the results are few and far between. Jeff Green at #5 was a disappointment, Randy Foye at #7 in 2006 was a nothing and the jury is still out on Marcus Smart in 2014 especially since Boston should have taken Julius Randle but drafted need instead of best player available. Ainge made the great trades to land Ray Allen and Kevin Garnett and got some excellent complimentary pieces for the 2008 championship team. He also took apart the team by prematurely trading Kendrick Perkins and not resigning Allen. Getting Al Horford was a big step, acquiring Isiah Thomas and Jae Crowder was impressive also. But the draft record has become concerning especially for a guy that spends so much time scouting and has built his reputation on it. We know the Cubs haven’t won in a century, but the Indians haven’t won in 68 years. It seems like it is finally the Cubs time and on paper they are clearly the superior team, but games aren’t won on paper. Cleveland has overcome serious starting pitching injuries, but for the first time they won’t have the managerial edge as Joe Maddon is every bit as smart as Terry Francona. Nevertheless, I am sticking with the Indians who I predicted would win it all before the playoffs even started (putting it in writing will certainly jinx it). James brought mojo back to the city of Cleveland, and for the 16th time in North American sports history, the same city will win championships in different sports the same year.